CD alone $15, Book & CD $40. Peter’s work is artistry at the highest level: not only a gift to singers in a wide variety of settings, but also a model worthy of study by songwriters and composers in any tradition. –Mark Simos, Songwriter; Associate Professor, Songwriting, Berklee College of Music Author of Songwriting Strategies: A 360º Approach (Berklee Press, Hal Leonard, 2014). MORE COMMENTS about “Fifty-five Anthems” from choir directors. Peter and Mary Alice’s choral arrangements and compositions are being sung by community, church and hospice choirs throughout the U.S. and the UK. Now the Amidons have published two books and companion sampler CDs of collections of their most popular, musical and accessible arrangements. 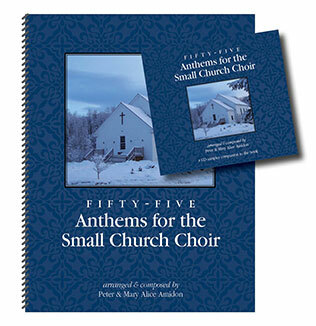 This book “Fifty-Five Anthems for the Small Church Choir” is geared particularly to choirs in small, mainstream Protestant churches. Many of these were originally arranged or composed for the Guilford (Vermont) Community Church Choir, UCC, which rehearses only for the 40-60 minutes before each Sunday service, so the anthems are accessible to the typical small church choir with a mix of music readers and non-readers. A second book, “Twenty-Five Anthems for Interfaith & Community Choirs“, is geared particularly to UU church choirs. However, both collections are useful to any church, community, high school or hospice choir. Here is a list of the choral arrangements/compositions in the “Fifty-Five Anthems” book. “Sweet is the Day” was composed/arranged by Mary Alice Amidon. All other arrangements by Peter Amidon. You can hear recordings of most of them by clicking on the titles. Motherless Child – traditional; Peter’s SATB arr. based on Maggi Tucker’s piano arrangement.